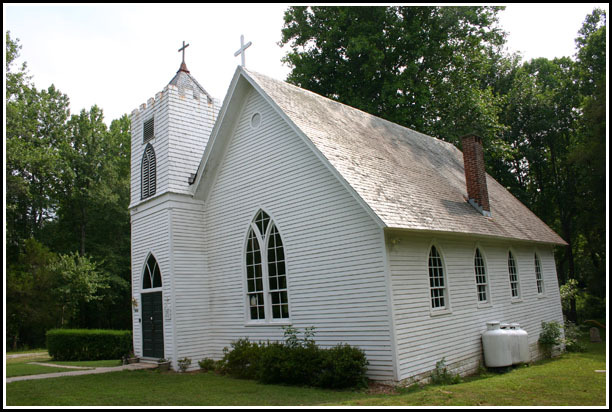 Comments: St. Stephens Episcopal Church in Esmont, Virginia, is part of historic Saint Anne's Parish. It was built in 1914, and the church cemetery contains about 64 marked graves as of September 2017. Directions to St. Stephens Episcopal Cemetery from Scottsville Museum: Go West on Main Street and turn right on Valley Street. Continue up Valley Street which becomes SR20. Turn left on Irish Road (SR6) and travel West six miles. At the Episcopal Church sign on SR6, turn right on SR715 (Esmont Road). St. Stephen's is approximately 0.6 mile on the left. In July 2007, Rob Manoso, an intern at Scottsville Museum from the Institute for Public History at the University of Virginia, prepared a listing of the extant gravestones at St. Stephens Episcopal Church Cemetery. Rob's listing was updated by Connie Geary in September 2017 as detailed below. Women are listed by their married names. Also, asterisks (*) that appear before names denote veterans.